Grumbles about winter gardens are not justified. The fault lies firstly with us and our fair weathered nature. We shop when its warm and buy what we see in flower in May and June and miss the winter flowers. Go shopping on a mid winters day and you will then appreciate we have colour all winter. 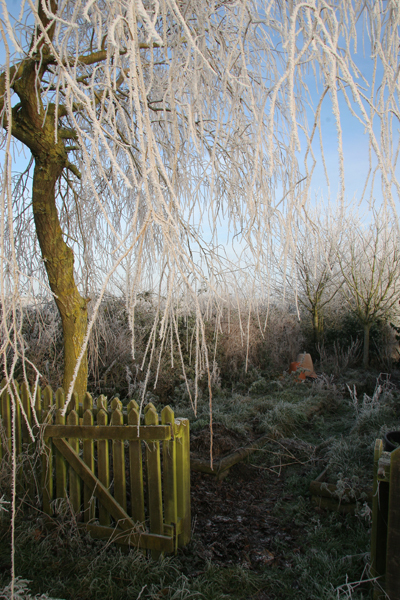 The second responsibility for this travesty is Monty Donn and the Beechgrove team as they stop broadcasting in November, thus implying the garden is closed until spring. Tall stemmed perennials, attractive seed heads, plants with interesting texture like grasses, coloured stems, berries, bark, catkins, garden structures, shapely trees, reflective water and evergreens. These arethe bones you are left with when winter settles on the garden. Don't be down hearted as these may not be abundant with flowery buds but they can have an ethereal beauty all of their own. A frosty morning is a beautiful morning and against a strong blue sky a haw frost has to be one of the most beautiful sites all year. Choosing to leave your more structured perennials unchopped until spring will allow them to form the icy silhouette shapes that freeze so beautifully. Its also good cover for wildlife. 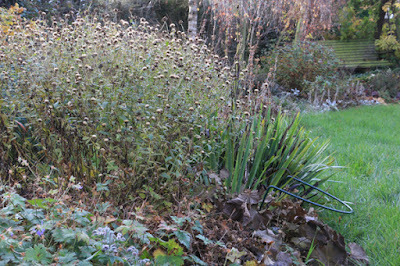 Structure perennials like this Aster frikatii Monch above or achillias and eupatorium have great sturdy stems that deserve a good haw frost experience. 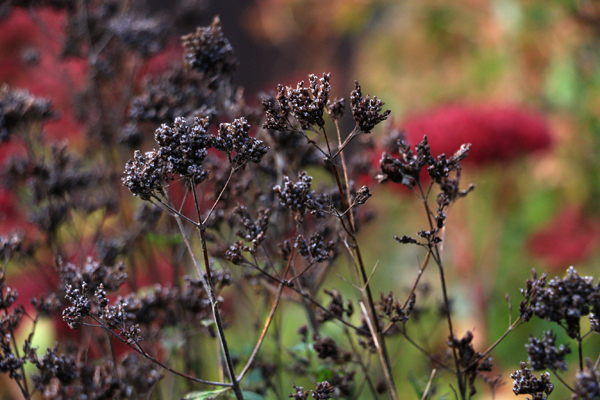 Adorn your garden with spikes and seed heads like these. I have heard them described as plants that look good in death. Hydrangeas fall into this category as they look fabulous dead. 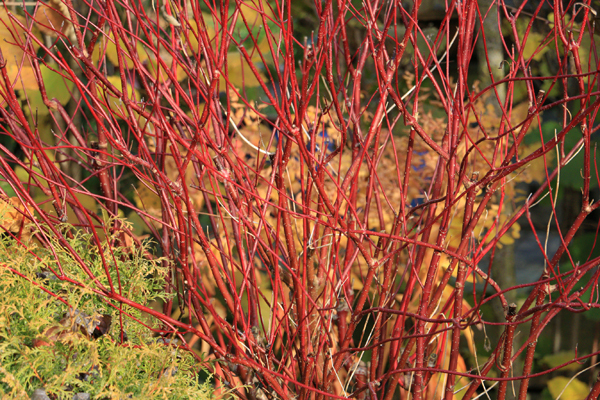 Cornus stems are so colourful. Seen here against a yellow thuja conifer it positively glows its so bright. Chose from dark red to lime green or orange or even perhaps plant together and mix them up. Oranges and red are electric in winter. Look closely at the stems of your shrubs and many will suprise you. 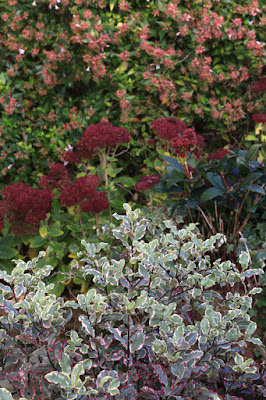 Some of the macrophylla hydranges have hidden red stems and shrubs like physocarpus can also have rich red stems these can all provide good winter interest. 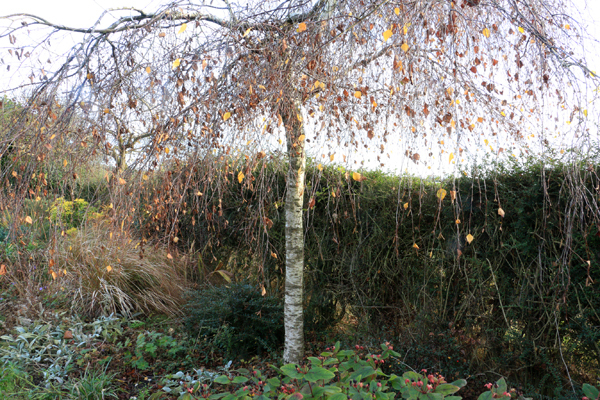 Add to the bare bones of your garden with some great shaped trees like my small Betula pendula Yongii with faboulous silver bark and gnarled figure. 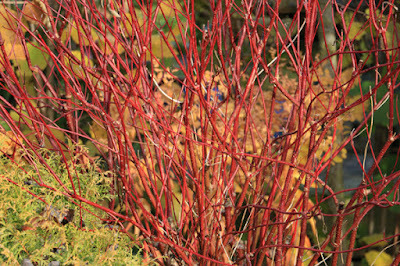 Consider some of the salix with amazing coloured stems and shape. Pollard, topiary cloud prune and bonzi. These make great winter silohette shapes. Every day shrubs and perennials can surprise you. 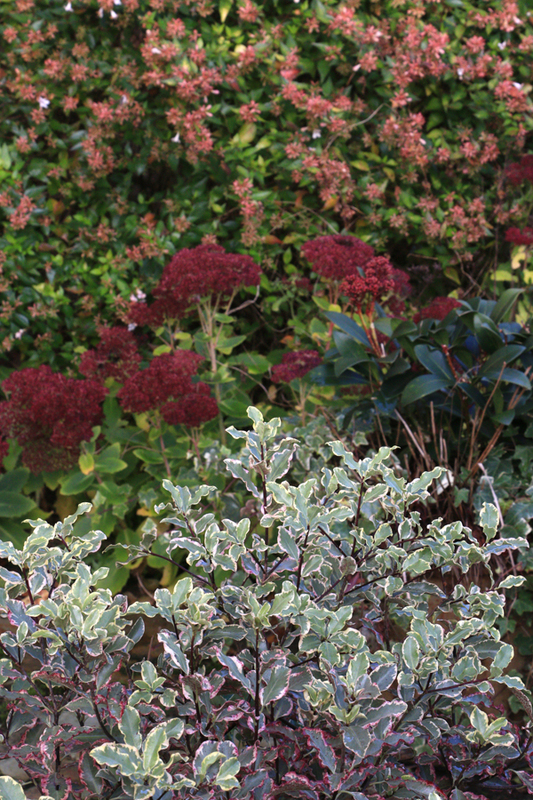 Abelia, sedum and pitasporum are every day plants, here together they look so winter colourful. Both abelia and pitasporum are evergreen and the sedum look great in death making great seed heads to catch frost. If you need flowers they are plenty out there even in winter. Easy bedding colour can be found in instant violas, pansies, bellis and primroses and we are blessed with some great winter flowering plants. Heavenly hellebores, sweetly scented saraccoca , Viburnum tinus and viburnum bonariensis, mahonia, flowering winter cherry trees and witch hazel, spring to mind as winter flowering plants and in addition to the trees, shrubs and perennials there is also a mass of spring bulbs and together this makes any grumbles about a lack of winter flowers totally inexcusable! There is no such truth only a lack of imagination. 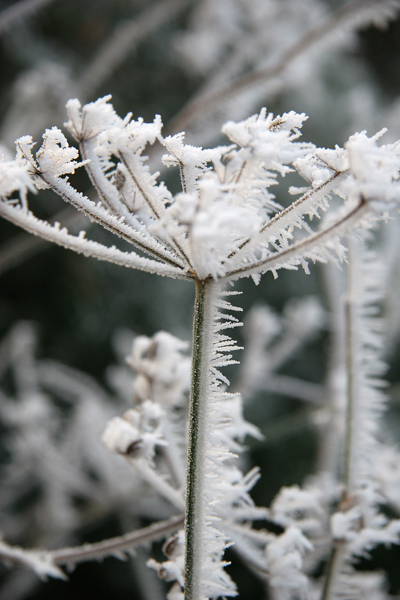 Take a glance at our ideas for winter pots.